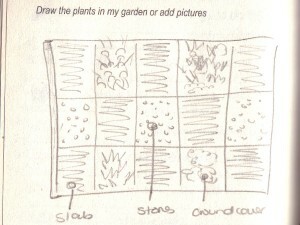 Hi Chris, I am now planning phase 3 of Back Garden Project. I have two more patches to landscape, one being 2250mm x 2700mm next to the pool just beyond the new grass patch. Now, here I want to put a type of patio – similar to the one you have near your pool area with flagstones. I want to do something different that included sandstone pebbles and ground cover as well. So it will be a type of patchwork patio. I have tried to sketch it, as you can see, but this is not an accurate plan. I should have 5 blocks down and 6 blocks across (according to my measurements). The flagstone I want to use is a 450mm x 450mm size and it is a sandstone colour. I found this small nursery in Durbanville and the prices are cheaper there than my usual nursery. So I still want to do some more price hunting on the slabs. 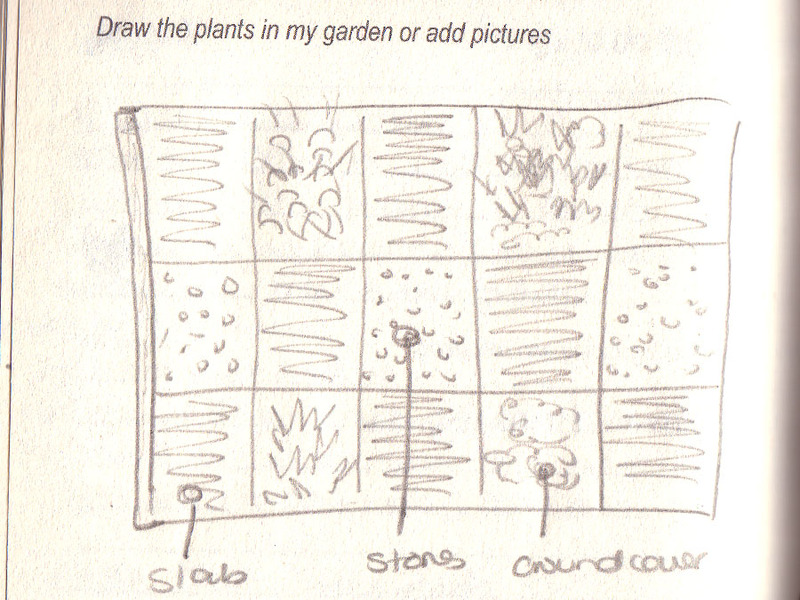 As my sketch shows (but not clear) the ground cover in between the slabs and stones will be herbs like thyme, oregenum, penny royal, mint…….. so when you sit on the patio, you can smell and eat from the herbs at your feet! We had a plan like that – but the ‘best laid plans’ have become the Karoo Koppie and Elephant’s Eye Light Railway. The Ungardener didn’t really like the idea, so it slid quietly away. But I LOVE that patchwork look. Especially a herb tapestry lawn, surrounded by paving.